Carrying your baby is extremely pleasant and comfortable, if you comply with the safety instructions. Please watch our instruction video carefully before the first use. Below instructions contribute to a safe use of the Pure Baby Love carrier. Never fully cover you baby, keep its head and face free, so you can see your baby. Your baby needs sufficient fresh air. There should be two-finger space between your baby’s chin and breast to allow proper breathing. Allow room for head movement. Don't use the hood of the carrier with small babies. The primary use of the hood is for supporting the head of an older baby if he/she fall asleep in a back carry. Better use it as neck support for small babies. Too early use of the hood will result in covering your baby's face. Your baby won't get enough fresh air. Ensure that your baby's head is close enough to kiss. This is the right height to carry your baby. And ensure your baby's legs are in the right position. Knees higher than their bottom. Ensure that your baby is positioned securely against your body. Too tight means there is a higher risk of suffocation, But when the carrier is too loose your baby can collaps in the carrier, which also gives a higher risk of suffocation. Always remember: There should be two-finger space between your baby’s chin and breast to allow proper breathing. Only use this carrier for children between 8 lb and 35 lb (4kg - 17kg). This carrier will fit mostly from size 56 to 92/98. The back pannel should support to the neck. If it is still too large for your baby even when you have adjust it to the smalles position, we recommend to wait untill your baby has grown a bit more. The head should be supported to the neck and has not to be covered. Fall hazard: Infants can fall through a wide leg opening or out of the carrier. Adjust leg openings to fit baby's legs snugly, before eacht use, make sure all fasteners are secure, take special care when leaning or walking, never bend at waist but bend at knees. Suffocation hazard: Infants under 4 months can suffocate in this product if their face is pressed too tight against your body. Do not strap the baby too tight to your body. Allow room for head movement. Keep your baby's face free from obstructions at all times. Carry your baby in front carry position, facing in, until your baby develops proper head control. Back carry is recommended once your child can sit itself. 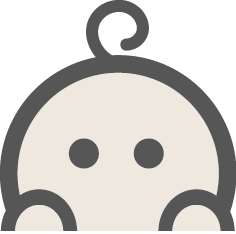 In front position, you are able to interact with your baby. When your baby shows cues of distress or discomfort, immediately take the baby out of the carrier if he/she continues to show signs of discomfort. Inspect the carrier regularly for signs of wear and damage. Check the full carrier before each use and discontinue use if the babycarrier is damaged in any way. Ensure proper placement of your baby in the carrier. Including the right position of the legs. Check the baby often. Premature born babies, babies with respiratoiry problems and babies under 4 months are at greater risk of suffocation. Check your baby often, Never cover the head of your baby and be sure your baby has a free airway. Your movement and your baby movement may affect your balance. Take care when bending to one side or forward. Never use a baby carrier during cooking, cleaning, drinking hot drinks, on a bicycle, in a car or during any sport activity. Check the temperature of your baby often. Your baby could become too hot in a baby carrier. Never fall asleep with your baby in the carrier. This will result in a great risk of suffocation. We recommend not to feed your baby in the carrier, because of the higer risk of choking. Pure Baby Love can not be held responsable of any misuse of the baby carrier.